What does this Musically Spiritual Quote tells us? 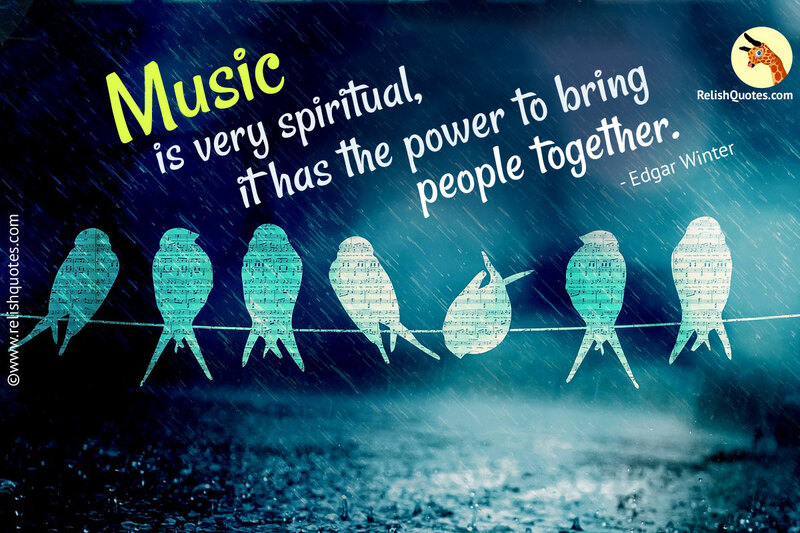 It is this Spiritual Quote by Edgar Winter, that helps us to understand, how to build a connecting chord between the world and God. Music is inclusive in the list of Spiritual Quotes and it rightly deserves to be one amongst them. This is so because music is food for the soul. This is very much a stamped fact, because every prayer that we utter has a musical note to it. Music always has been the binding factor of the society. Music bridges the gap of the rich and the poor, high class and lower class, the black skinned and the white one. It is way above and beyond this mediocrity. The human mind is always overflowing with the unresolved issues of human life. Whether work front or the family front, there is always something that keeps disturbing our mind. Music is something that provides peace, a calming and a soothing effect and brings relaxation to the mind. You will also notice that in every religion across the globe, the divine marriage of music and prayers is very significantly prevalent. It is customary to have a musical touch to a hymn, a song, a prayer, a holy verse from a sanctified scripture. Music makes the prayer even more holy and sacred. Music and prayer add meaning and a certain kind of charm and appeal to the listener’s senses. Adding a certain quotient of magnetism to the prayer is what music does. This adds up to the chances of people joining together in a group to pray for a certain cause. Music has always been used to ignite the inner fire and allure crowds of people together, to fight for a certain cause or protest for justified reasons. Music unites people for various reasons and enforces the collective power of people who come together and join hands for a specific objective. Music is bestowed with the power of uniting people and it takes the human soul on a spiritual journey of meeting the Divine.